Oh how envy you all that get to have houses!!! only a few of our chapters have houses, but then again we only have 16 chapters! either way, my chapter is in the city (chicago) and well we just dont get to have houses. i dont know if its a city law or a school law or what. but we have "unofficial" houses where a whole bunch of us lived. we just couldnt have the letters in front. 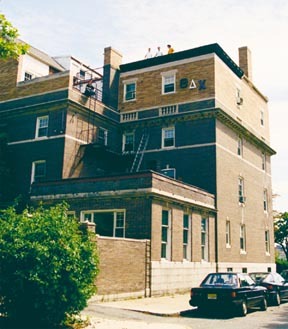 This is the Phi Delt house at Kent State. Our alumni fronted the $1.2 million to build it. This pic was taken over the summer, so don't mind the mess, LOL. 1/2 of our chapter room. (for the most part) are beautiful. i wish that i could share them with you, but unfortunately i am not technologically adept to do so. i will try to corral one of my tech. minded children to help me out! isukappa, i was at iowa state last june for the world odyssey of the mind competition and the beauty of the isu campus blew me away! i loved the neighborhood where most of the greeks were housed-lovely!and the iowans were such nice people,too! Yes, it's an old family house that was purchased by the University and then rented to the chapter. That's how all the houses at Lambuth are. 3 student live in the chapter house so keeping the house full is not that big of an issue. Last edited by gphib_95; 03-06-2004 at 02:47 AM. Here is the pride and joy of Epsilon Kappa chapter of KKG at the University of South Carolina! That's a really nice house, but where's the jacuzzi? PKTKKG That is one gorgeous house!!! Those EK Kappas are lucky ladies!! It's gonna be a hootenanny. Or possibly even a shindig or lollapalooza. Perhaps it'll be a hootshinpaloozaree. I don't know. Last edited by ZTAMich; 01-18-2009 at 09:14 PM. wow PKTKKG, that's some house!!! It's an awesome house, and by this August, we will have a brand new house on sorority row!!! Thank you! I'm very proud of it, and we worked so hard on it. The best part was the first formal recruitment that they held in August, just after we moved in.